Raghuraj Pratap Singh aka Raja Bhaiya, an independent MLA from Kunda constituency, took oath as a Minister in Uttar Pradesh. The inclusion of Raja Bhaiyya in the Cabinet came as a surprise, given the young chief minister's efforts to break away from the past tag of goonda raj' duringt SP's last rule in the state. During the campaign Akhilesh had said "Samajwadi Party will be strict on law and order. We will not tolerate people with criminal background," he had said. 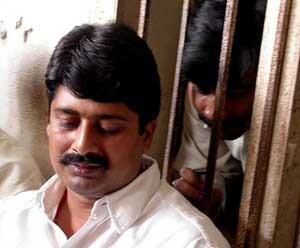 Raja Bhaiya has been elected from Kunda consituency and has several cases against him. While addessing his first press conference after he assumed charge as UP CM, Akhilesh was seen defending Raja Bhaiya by calling all charges against him a part of political conspiracy by opposition. People of UP provides SP absolute majority of 224 seats in the 403-member Assembly, then why Akhilesh need Independent candidate having criminal charges. SP will remove "Goonda raj", but how ? Is it end of Mayawati's so called Corrupt System or Beginning of "Susashan"
Is Raja Bhaiya so qualified that, SP didn't find proper replacement in 224 candidates. Akhilesh Yadav is new face of UP politics and people expects a lot but not that much. GUNDARAJ is back in UP, Be ready for Kidnapping, Murders and Rapes. Its really disappointing that wrong steps are being taken right at the very beginning of this new government. Leaders like Raja Bhayya may have only eight registered cases along with him, but he is known for his atrocities in the circles of Pratapgarh. His title is enough proof of his history. I was great fan of Sh. Akhilesh Yadav, But just within 10 days, all things changed...Feel cheated that..I Voted for "GUNDA" Gang..Shame on Akhilesh yadav...a young man..behaved like....people are fool....Lets dont be hero...5 year are not too much...SHAMEFUL....WHY NOT MAKE ABU SALEM/ CHOTA RAJAN HOME MINISTER.